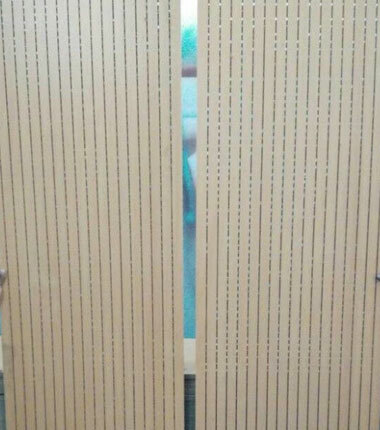 Leading Grooved Wooden Slats, Wooden Slats & Wooden Grooved Acoustic Wall Panels Manufacturer. 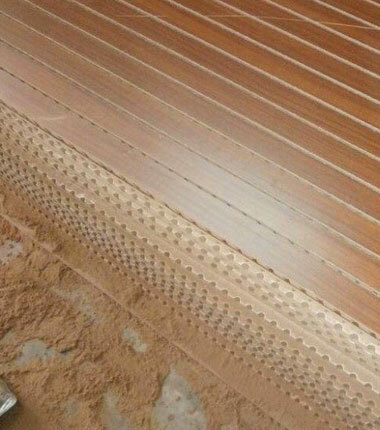 Envirotech Systems manufacturer Groove Wooden Slats have longitudinal grooves and slats, Grooved acoustic panel machined along the length of the panel. The base core board is an 16mm thick Fiberboard sheet with a finish laminated to its front face and black acoustic felt adhered to its rear face. These panels are consisting of a laminate finished surface, base core board and black acoustic felt attached on the back. The envirotech groove acoustical Slats consist of panels made from acoustical fireboards with linear perforations for excellent uniformity. These panels can be place with 50 mm thick acoustic insulation backing which will enhance acoustic properties of entire system. The groove wooden slats Materials based on acoustic theory, remarkable sound-absorbing function, middle and low frequency sound-absorbing effects especially renowned.